90 View from the Cellar The 2016 Verdejo “Egeo” from Isaac Fernandez is produced from sixty year-old vines planted on sandy clay soils. The wine is lovely, wafting from the glass in a classic bouquet of Granny Smith apple, lime peel, green olive, salty soil tones and a topnote of dried flowers. On the palate the wine is crisp, medium-full and zesty, with fine focus and grip, a lovely core, good backend mineral drive and a long, complex and succulent finish. Just a lovely bottle of Verdejo and a superb value! 2018-2022. 92 Wine Review Online This is among the best Rueda Verdejos I’ve ever tasted, and certainly the best vintage of this wine (and I’ve tasted almost all of the vintages that have been imported to the USA). It shows a truly medium-bodied profile, whereas most of its counterparts are light, and yet its unusual heft doesn’t come at the cost of any lack of freshness. On the contrary, it backs up its flavors of melon and figs with very zesty citrus acidity that focuses the flavors through the long, generous finish. Very expressive in aroma and flavor, and supremely versatile at the table, this is a standout wine at a great price. 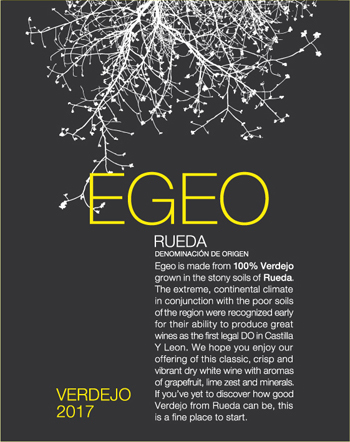 90 View from the Cellar The 2017 Verdejo from Egeo hails from sixty year-old bush vines and is a lovely example of this varietal and a truly exceptional value, as it retails here in the US for only $15 per bottle. The bouquet of the 2017 delivers a fine aromatic constellation of lime, tart orange, a touch of green olive, salty minerality, just a whisper of cut grass and a pungent floral topnote redolent of lime blossoms. On the palate the wine is crisp, full-bodied, complex and loaded with personality, with a touch more sauvignon blanc-like grassiness than the nose suggests, with a lovely core of fruit, good transparency and lovely length and grip on the tangy finish. This is really good wine for its price point. 2019-2025. Feel free to add your notes and rating. 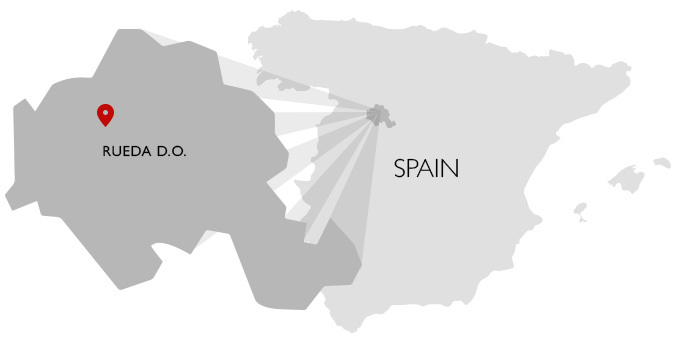 © Copyright 2019 Grapes of Spain.